I am not a car guy. In fact, I’m not sure I’d ever heard of a catalytic converter before joining the staff team here at Donate a Car Canada. I had no idea about what went on at a scrap yard. After market parts? Not a clue! That has changed (a little) over time as we have the opportunity to connect with donors and agents who have “Car Guy” as their middle name. You know who you are, and we have a lot to thank you for! You have patiently educated the likes of me, introducing us to vehicle models that are the stuff of dreams. You understand the market (and why we have to break hearts with low returns from time to time). You thrill at the idea of benefiting a charity via something you love so much. 2. You’ve owned at least one brand of car that your local insurance agent has never heard of, and you have to spell it twice. Or three times, in the case of the Innocenti Mini Matic T1000. 4. You have a whole drawer filled with cruddy, slightly rusty “take-off” hose clamps, which you will never use again. Unless you need to get an engine running at midnight when the auto parts stores are closed. 6. You spend Sunday watching three different types of racing on Speed Channel, and on Monday morning someone at your office says, “How about those Bears?” and you don’t know whether they’re talking about football or a fire in Yellowstone. 7. You own a “cherry picker” engine hoist that’s all spattered with overspray from a defective nozzle on a can of chrome-aluminum spray paint that also hit your Cobra poster. 8. The left fingertips on the rubber glove in your bead-blasting cabinet are all worn away from holding small carb linkage parts. Your fingerprints don’t look so good, either. 9. Jay Leno’s garage seems like an island of enlightenment and perfect sanity in a world gone mad. 13. The only time you use unprintably foul language is when you’re alone in the workshop and things go really wrong. Which is about every five minutes. 16. There is no day so bad that the sight of a buff-colored issue of Hemmings in your mailbox doesn’t dissolve all worldly cares. 19. The electrical parts drawer in your toolbox contains two high-performance Lucas Sport Coils that look brand new, but you honestly can’t remember if they’re new spares or if you took them off a race car that was misfiring. So you never use them and you never throw them out. 22. You own at least one Nomex racing suit that you’ve “outgrown” and one or more helmets with expired Snell stickers, preferably from another century. 23. When you go house-hunting with a realtor, you automatically reject any home without room to park a car trailer—or at least a place to hide one, if it’s one of those upscale neighborhoods where zoning laws are concocted to keep out people exactly like you. 25. You have a surprising number of friends whose children are named for legendary members of Team Lotus. 27. You never completely bond with any dog that doesn’t enjoy riding in a car and looking out the window. 30. You imagine that someday you might own an old beater of such low status that it won’t bother you to mix brands and viscosities while doing an oil change. That day never comes. 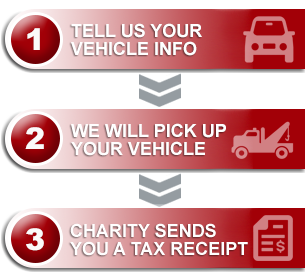 Company Logo on Your Donated Vehicle? No Problem!